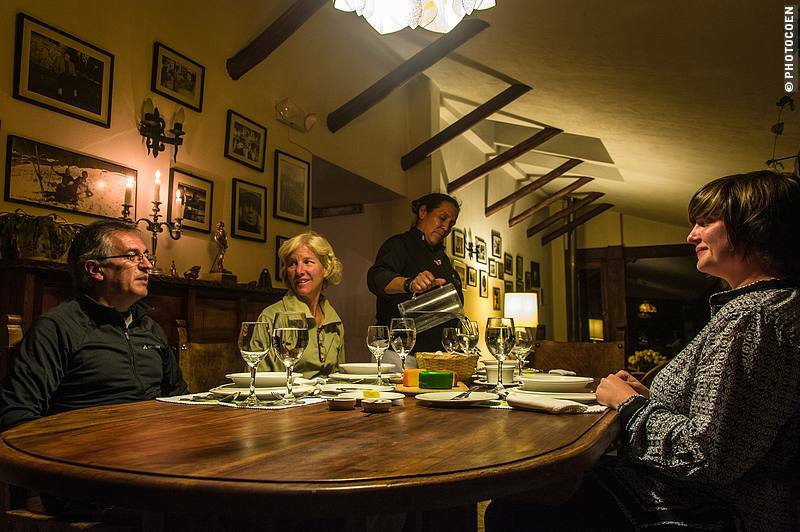 A couple of weeks ago, Fernando Polanco Plaza invited us to Hacienda Zuleta, his family farmstead in the Andes Mountains of Ecuador. Some 20 years ago, Fernando started modifying the beautiful, 17th hacienda, which traditional business consisted of milk cows, a dairy farm, a cheese factory, and the cultivation of grains and potatoes. Thanks to Fernando’s efforts, the hacienda nowadays offers visitors a luxurious accommodation and a range of outdoor activities. The hacienda was built in the 17th century by the Jesuits but has been a private property since the 18th century. Sharing a meal in the hacienda’s ‘comedor’ in the good company of other guests. The living and dining room have remained as they were when the family still lived here, characterized by antique furniture, fireplaces and family photos on the walls. Hacienda Zuleta is a place to take off your shoes, curl your feet underneath your legs in a comfortable sofa, and spend an afternoon reading one of the hundreds of books on the shelves, either in English or Spanish. Oh, and eating lots of semi-aged cheese! 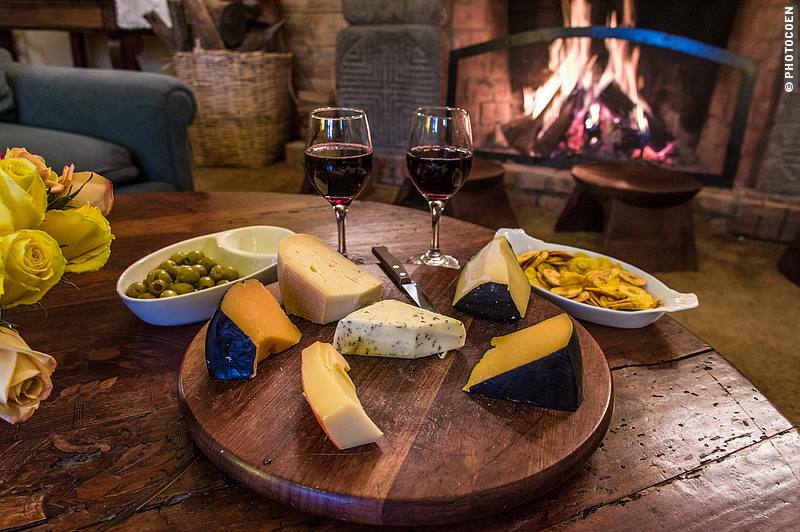 Every day you can take your pick from different cheeses (and yes, some guests could use some instruction on how to properly cut a cheese; note this is not our doing!). But before I lose myself in talking about all the comforts and coziness of this place, let me get to what I wanted to share with you. Haciendas have horses, and so does Zuleta. 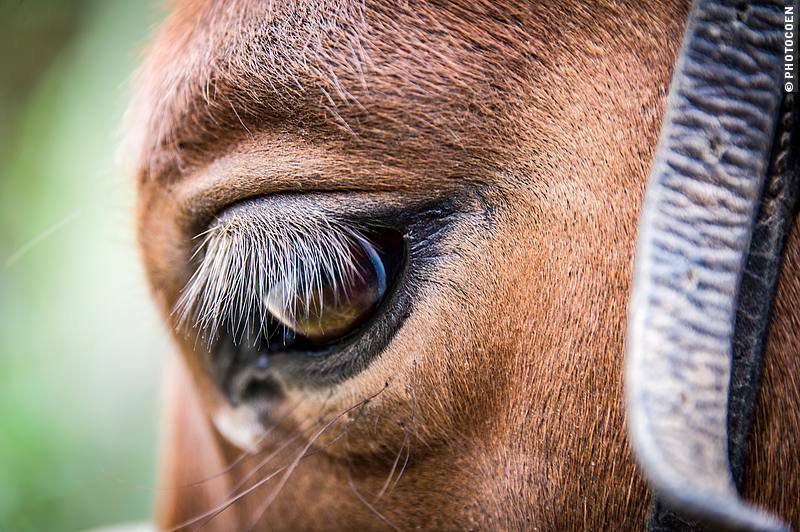 Some 50 extraordinary horses are a result of breeding Andalusians with Quarter horses (and in the past with Thoroughbreds). You can watch them grazing the hacienda’s surrounding pastures and visitors mount them to explore the surroundings (read about it here). 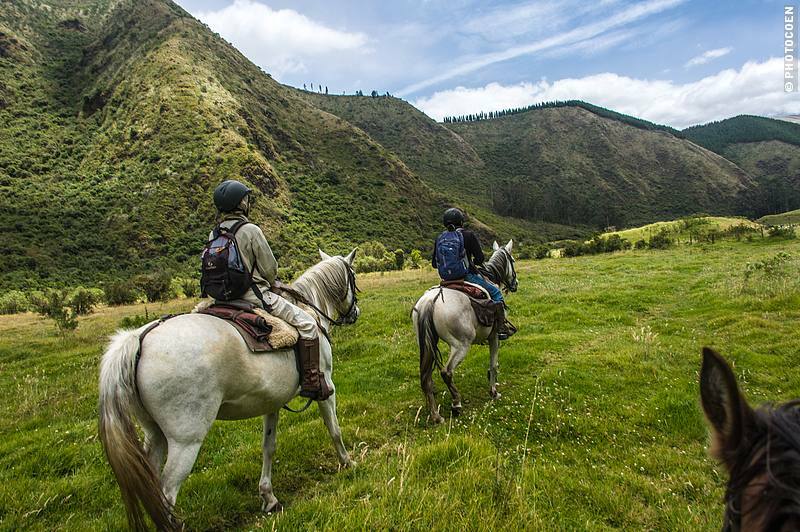 Horseback riding to the ancient, truncated pyramids of the Caranqui Civilization. Our local guide David is preparing the horses for a ride. While we were enjoying one of the horseback rides on offer, we wondered where the monturas came from; the saddles and the reins. Our guide David told us that they are made by a man who lives in the community of Zuleta, which lies within the grounds of Hacienda Zuleta. We decided to visit the workshop and hear his story. Jaime learned the job from his father who was a saddle maker for 70 years.”I don’t know exactly when I started. I began helping my father when I was a child. My father is retired now but he still frequently checks out what I’m doing. He likes to point out details or gives tips on how to improve my work. Jaime with a saddle frame – note tools neatly organized in the back. Meanwhile Jaime showed us the wooden frames: different ones for trail riding and the ones used by cowboys. We learned about the various types of leather, how to work the leather, and what steps are involved in making a saddle. It’s all handwork, including the stitching. The latter surprised us, especially since there was a sewing machine in the workshop. “No, that is just for things like hats and other small stuff. 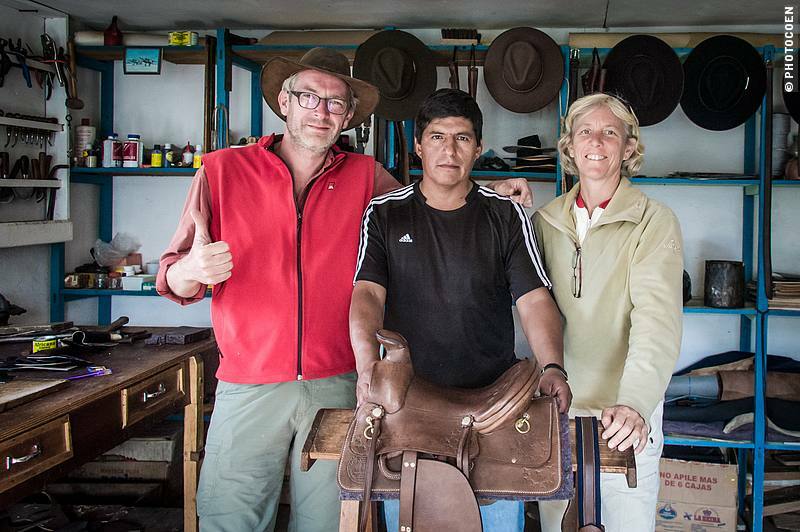 For stitching saddles I have a special chair,” Jaime said and put a wooden structure in front of us with a vise for the leather. 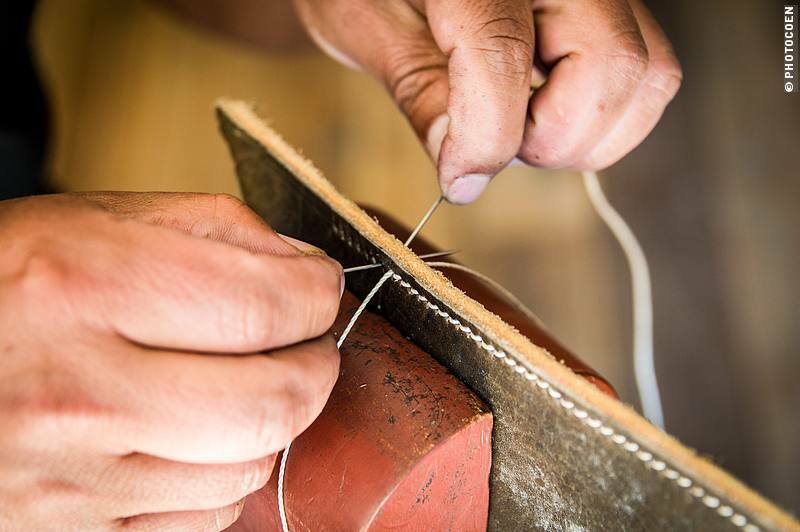 He demonstrated how each hole needs to be pierced with one tool before he stitches the leather using two needles with thread at the same time. Simple but ingenious! The making of one saddle takes two months. Considering the fact that a saddle costs about 850 U.S. dollars, you can imagine that this is not a big-money-earning business. For that reason Jaime has doesn’t have saddles on stock but only makes them on demand. 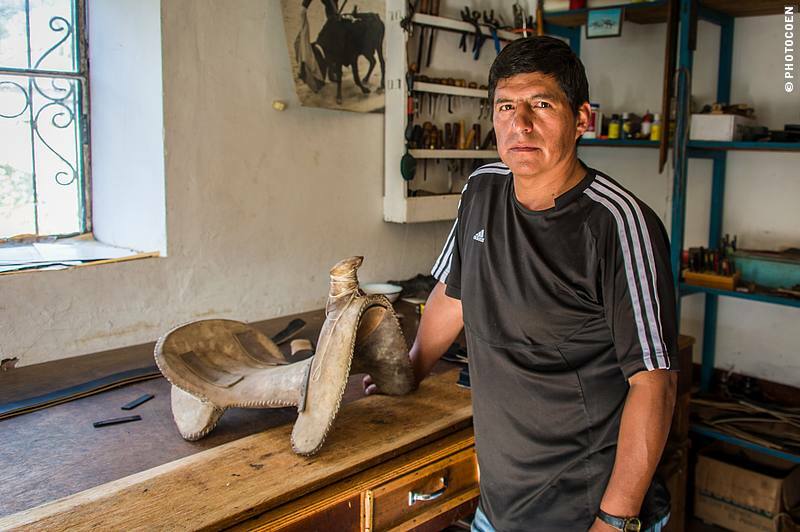 In the workshop he has one saddle which he uses as a showpiece. “So people know what I kind of quality I deliver.” For more examples he has a photo book displaying saddles he made in the past. Jaime also makes other things from leather such as hats and belts. If you’re looking for something artisanal when visiting the region of Otavalo and Ibarra, this may be a place to check out. 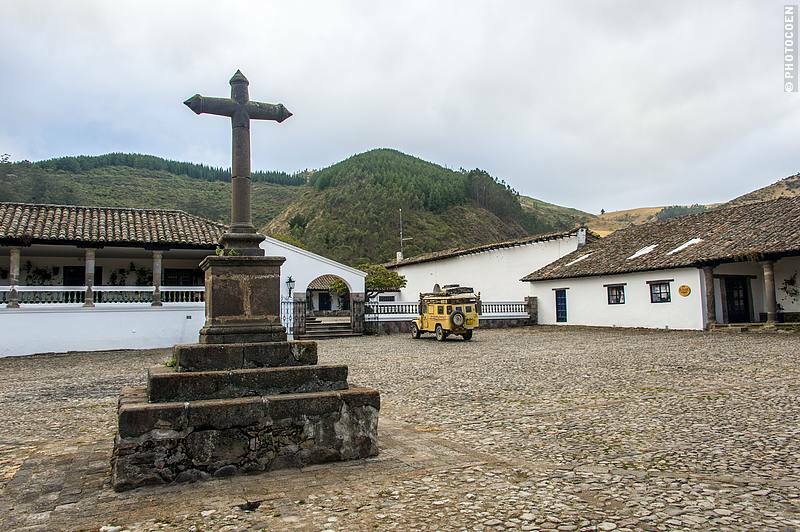 (The shop is situated just on the left side of Hacienda Zuleta’s entrance). 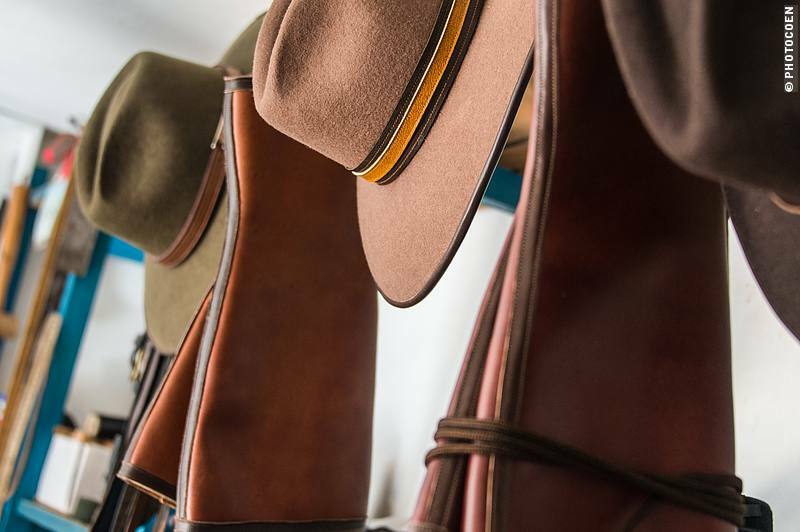 Hats, belts and half chaps are some of Jaime additional handicrafts. I enjoyed watching the pride he takes in his job. 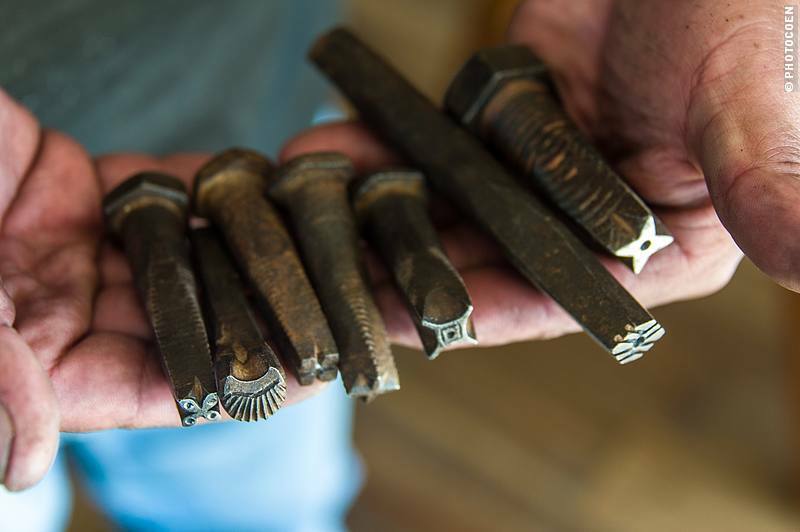 All tools date from the time his father ran the workshop. Coen and I both fell for old bolts, of which his father had carved the tip into figures to decorate leather with. By hitting on the bolt with a hammer you imprint the design into the leather. The bolts with the figures at the tip. We crossed the street and walked into a walled-in garden where we met his father Oswaldo Sarzosa. 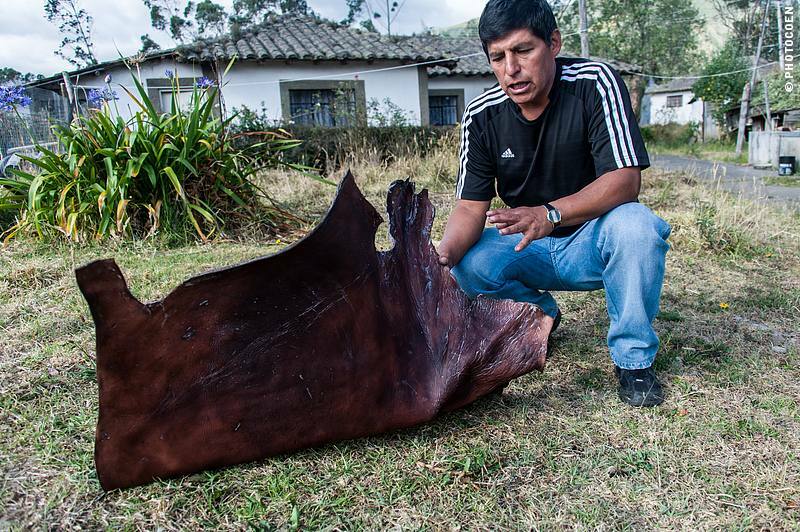 Here Jaime prepares the leather which he buys from farmers in the area. The leather comes from cows that died of age when giving birth, or from an illness, but the cows aren’t specifically killed for the leather. Local plant used to work the leather with. The leather is treated with chalk and a local plant, after which he impregnates it with a special kind of grease (family secret!) to make the leather soft and flexible. One piece of leather lay soaking in a cement bath while another lay on the grass with the grease on it. Being here felt like we got a bonus; Jaime didn’t have to show us this part. There was no way we could have known there was more than the workshop. Yet he did, and I appreciated that gesture. Jaimy demonstrating a piece of leather covered with grease. We returned to the workshop and got into the discussion about traditions and the future. It is not clear what his future will bring. 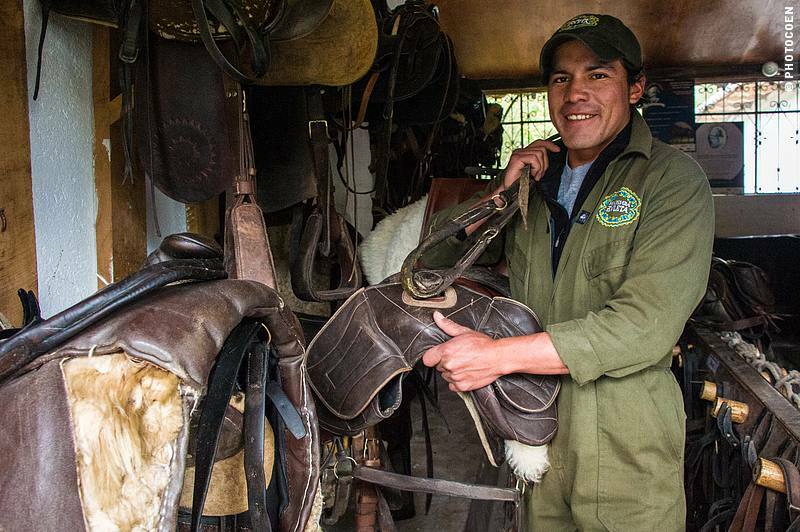 There isn’t too much work as the saddles last for dozens of years thanks to the high quality that his father and Jaime put in their work. Who knows if Jaime’s son wants to continue this tradition. “Things change you know, nowadays kids go to college and want to work in an office,” Jaime commented. We said our goodbyes and returned to the hacienda. 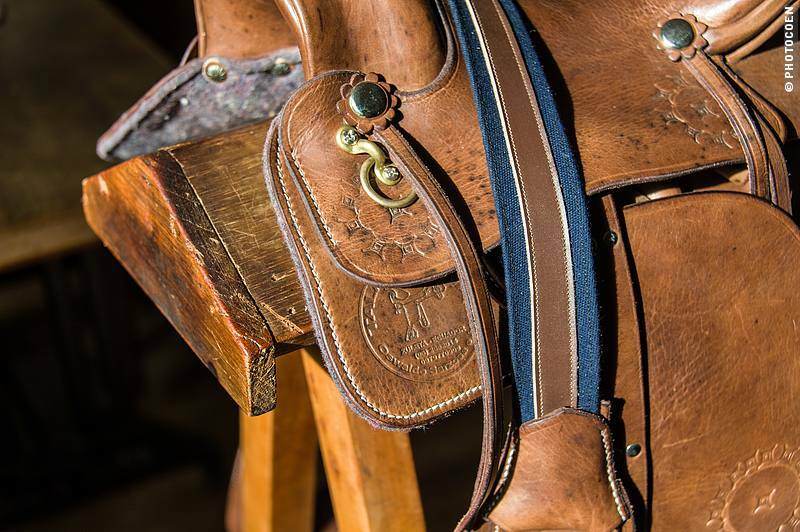 The next time I sat on one of the hacienda’s horses, I looked at the saddle with a fresh, admiring eye and a deeper appreciation for the handicraft. I hope Jaime and his family will find a way to continue this tradition. Thank you Jaime, for your time and detailed explanations. We wish you a bright future with your handicraft! For more information, check out Hacienda Zuleta’s website. This entry was posted in Accommodation & Camping, Ecuador Travel, Meetings by Karin-Marijke Vis. Bookmark the permalink. What a story, and what a place! It’s inspiring to see the imagination and creativity at work here – with lots of hard work as well, I’m sure. It looks heavenly. Thanks for the story and the inviting pictures.